Whilst primarily arising from a dispute over contract terms and the value of the works, the decision in Trant Engineering Ltd V Mott MacDonald Ltd  is of particular interest as it is the first published case where BIM features substantively, writes Sarah Rock. Trant was engaged by the MoD as contractor for a £55m project in respect of the construction of a power station in the Falkland Islands. Mott MacDonald was appointed to provide design services and was also the building information modelling (BIM) coordinator, controlling access to the common data environment (CDE). When a fee dispute arose, Mott MacDonald suspended its services and blocked Trant’s access codes to the CDE leaving Trant and the rest of the project team unable to access the design materials. Pending resolution of the substantive dispute, Trant made an application to the TCC for an interim injunction requiring Mott MacDonald to provide access to the CDE (including the design data) both to Trant and to others involved in the project. The full judgment is not yet available but summarising reports seen to date, (insofar as relevant to the CDE), the TCC concluded that it had a high degree of assurance that Trant was entitled to have access to the design data which had, in fact, already been placed in shared folders. It was particularly relevant that Trant had previously had access to the CDE before Mott MacDonald had suspended performance of its services. The TCC therefore ordered Mott MacDonald to restore access to the relevant design materials, subject to Trant making a payment into court. Specifications for how a BIM CDE should work can be traced back to BS 1192-2007, and the publicly available specifications and British Standards which followed and make up the 1192 suite of documents. These documents form the bulk of the pillars of BIM Level 2. To date, in these admittedly early stages of BIM adoption in the UK, the question of who will actually host the project CDE has tended to be decided primarily on practical factors ie yes, who is at the centre of the information flow process is very important but, perhaps most significantly, which party has the technical capability in addition to sufficient knowledge and experience of BIM technology to ensure that the project is able to progress smoothly from this perspective. Clearly, appointing a host without this capability could have disastrous results. A CDE could take the shape of a project server, extranet or file-based retrieval system. Increasingly CDEs use cloud-based software to provide the digital space to hold and share the information. Parties in a construction project are unlikely to own their own digital storage space to the capacity required for a BIM-enabled design and construction scheme, and so the digital storage space is often outsourced. Contracts for the hiring of such spaces tend to come with little or no liability on the cloud outsourcing vendor’s behalf. Therefore, the party responsible for hosting the CDE may be unable to pass down any risk to the cloud outsourcing vendor. The Trant case highlights the vital role of the host of the CDE within a BIM design and construction project, as the host holds the keys to the data room for the entire project. By denying access to the CDE, the host not only withdraws access to their own designs (which a contract may well allow, for non-payment or suspension) but potentially also denies access to all other designs held in the CDE, as well as access to the programme, schedules, contracts etc. The host is therefore the gatekeeper to the entirety of the project information held digitally meaning that the role (as highlighted by the Trant case) is crucial to progress, and therefore, the successful completion of the project. Following this decision, fresh debate has begun in the BIM community as to who is best placed to take on the responsibility of hosting. Should the employer host, allowing them full control over access to the data room for the entire project? Thus if a dispute arose between the employer and one participant in the CDE, this would potentially have less impact on the rest of the project. The employer could either revoke the access of the party in the dispute (subject to contact terms) or the party could remove or stop uploading their own data. But do all construction employers have the technical knowledge and capability to fulfil the role of CDE host? Alternatively, as we have seen on some larger scale BIM projects, the responsibility for hosting could be split between the employer and a member of the project team. Utilising the 1192 CDE work flow and gateways, design materials could be hosted entirely on the project team member’s CDE up until the point where they pass through the published gateway. At this point the design becomes valuable to the employer and so is moved from the project team member’s CDE to one hosted by the employer. How the CDE is to be hosted remains a project-specific decision, bearing in mind factors such as capabilities, technical knowledge, size of the project and risk allocation – and must be clearly reflected in the contract conditions of all relevant parties. Forms of appointment, contracts and BIM protocols need to be reviewed to take into account the decision in Trant. Parties need to ensure that they are adequately protected and that data required for the success of the project as a whole is not allowed to be used as a bargaining tool in a bi-party dispute. Canada is making a huge effort not only in the adoption of BIM, but also in involving all professionals in a growing community where they can learn and contribute to the development of standards, documentation and other activities. Several small pilot projects, developed by the Quebec Society infrastructure. buildingSMART Canada started increasing its activity in 2004 when they collaborate with the Data Dictionary at buildingSMART, developed by buildingSMART International. From then on, the Canadian chapter has worked hard to promote and enable the movement towards a better built environment for Canada through the development and use of open standards for BIM. By joining buildingSMART Canada, individuals become part of a growing community that is promoting excellence in the built environment by implementing collaborative working practices in Canada and around the world. Members can participate in the development of standards, protocols and programs through work groups centered on activities described in the national roadmap, available on the buildingSMART Canada website. You can also follow the Canadian chapter through its Twitter accounts: @buildSmartCan and @InstituteBIMCan. Susan Keenliside, Chair in the Member Community of buildingSMART Canada, explained in the symposium ‘BIM Implementation Strategies‘, how BIM is being adopted in Canada by presenting the roadmap they are following for BIM implementation in the country, defined by 6 areas of activity: Engage, Develop, Educate, Deploy, Evaluate and Sustain. 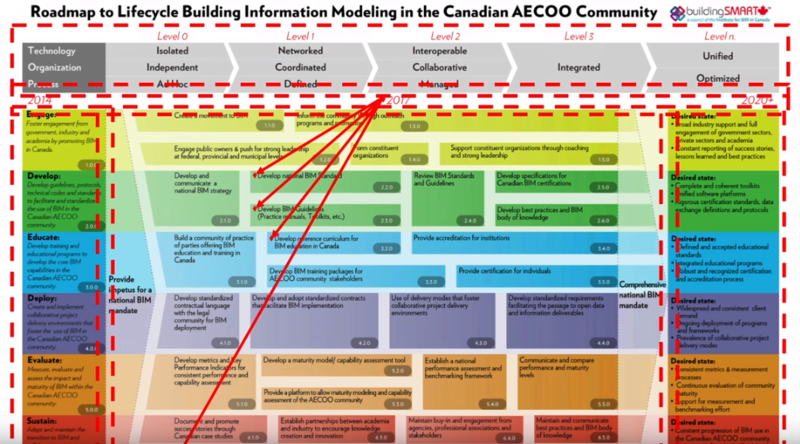 The Canadian roadmap is being used as a guide for many companies from different countries that are facing BIM adoption. Soon to come up is a Practice Manual for BIM divided in three parts: A Primare, on specific to company context and one specific to the project context. This is the result of the efforts of over sixty dedicated expert practitioners who volunteered for the effort and the text and illustrations for the practice manual have been completed. Another essential tool just launched in Canada is a discussing board forum. “The focus is BIM best practices. We are not focusing on a specific software, but we are getting the conversation going on BIM in general”, explained Keenliside in the symposium, who also repeatedly encouraged professionals to join the Canadian community. You can join the forum here! This intervention was part of the symposium ‘BIM World Implementation Strategies‘, organized by Zigurat Global Institute of Technology, BIM Freelance and BIMCommunity, where speakers from 8 countries presented the BIM implementation strategies that are being adopted in their territory. All the speakers were key figures of different buildingSMART chapters. Here you can see Susan’s presentation about Canada’s case. Do you know about the Global BIM Management Certification Program from Zigurat? This popular international program caters to the needs of professionals in more than 20 sectors of the AECO industry, by providing with the BIM methodology, tools and skills necessary to become leaders in BIM implementation. Susan Keenliside is collaborating in the 1st edition of the Global BIM Management Certification Program as part of the faculty board, which features other lecturers such as Bill East, Jared Banks, Jeffrey W. Ouellette, Jacob D’Albora, Mohsen Far and more. Canada BIM Council’s mission is to provide their professional, educational, construction, fabrication and supply chain members a collective voice dedicated to BIM. Become a fully capable BIM Manager working in construction projects with high-performance teams from all around the world by joining this global program that begins the 24th May. This is your last chance! BuildingSMART Canada is proud to announce the launch of an online forum for ‘BIM in Canada’. The forum is supported by industry experts, and offers a unique opportunity to discuss issues and topics relevant to Canadian industry implementation. Network with your peers from across Canada today! Cazza, a US-based construction start-up, has announced plans to build the world’s first 3D-printed skyscraper in Dubai. The announcement is the latest in a succession of firsts, as 3D printing seems to be gathering steam. The first 3D printed bridge, first 3D printed office and first 3D printed excavator, were all completed last year. According to the firm the high rise will be created using a new technique, which it has dubbed “crane printing”. This technique will use cranes with printing units specifically designed to incorporate added units that are specifically designed for printing structures above 80m high. Explaining the thinking behind printing upwards Chris Kelsey, CEO of Cazza, was reported in Construction Week Online as saying: “When we first thought of implementing 3D printing technologies, we were mostly thinking of houses and low-rise buildings. According to the company its crane printing process will include all major structural components of the skyscraper, including reinforced steel and concrete. The rest of the building will be completed with a combination of 3D printed components and traditional methods. The skyscraper, however, may not be happening in the near future because although Cazza has announced its plans, it has not yet disclosed any of the details of the project, including the building’s client, planned height, site, budget or any commencement or completion dates.